As Zack Handlen mentioned in his season-ending review of “The Secret War Of Lisa Simpson,” the show’s eighth year marked the end of its untouchable creative apex. 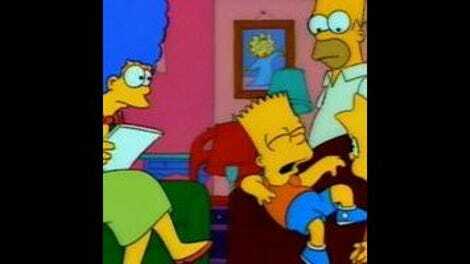 From here on out, we’re in The Simpsons’ decline phase, though there’s plenty of room to disagree just how stark the drop-off actually was. I’d count myself among those who consider at least the ninth and tenth seasons to be full of legitimately excellent episodes, albeit only rarely attaining the kind of perfection that the preceding seasons reached as a matter of course. But no matter, because that can all wait for some other time, for a few reasons. For one thing, today’s episode was a holdover from the previous, Bill Oakley and Josh Weinstein-run production block, making it an honorary season eight episode. And, well, if we’re going to talk about why “The City Of New York Vs. Homer Simpson” is notorious in Simpsons lore, it isn’t as the first episode of the post-Golden Age. Aired almost precisely four years before the September 11 terrorist attacks, the episode now serves as a time capsule for a New York in which the World Trade Center still stood. Given the episode’s heavy focus on the towers, it’s not hard to see why the episode was removed from syndication for several years, and the quintessentially Simpsons line about how “they stick all the jerks in Tower One!” is, as co-showrunner Bill Oakley put it, regrettable in retrospect. I’ll say this much: I was a 13-year-old New Jersey suburbanite on September 11. I didn’t know anyone personally who died, but a neighbor who lived in our cul-de-sac and the father of a classmate both died in the World Trade Center; the attack certainly wasn’t as personal for me as it was for others, but it was at least proximate, and something I probably still haven’t completely processed nearly 15 years later. And I do remember, in one of the frivolous moments of that processing, once thinking that I would never want to see this specific episode again, that it would be too difficult to see even an animated World Trade Center used for comedy. More than a decade later, there’s a catharsis to be had here. It’s oddly endearing—if admittedly still a tad uncomfortable—to see the ridiculous New York stereotype shaking his fist at the other jerks as he hangs his washing between the towers; it’s heartening to see the World Trade Center not only as this grim memorial to one of the worst days in American history, but also just as one more aspect of the episode’s affectionate mockery of New York. I understand why so much is said about the need to never forget, but there’s something to be said for remembering as well, and this episode achieves the latter. I totally understand why I once never wanted to see this episode again, but I’m glad I’ve moved on to the point where this episode can represent something essentially positive. The reason this episode can sustain so many different audience interpretations—even when it’s all from the same person!—lies in the specificity of its storytelling, a quality that defined The Simpsons at height. The show sent animation stalwart David Silverman to New York to get hundreds of photographs of Manhattan, all with an eye toward capturing an authentic picture of not just the city but its people as well. In one of the DVD commentaries, episode director Jim Reardon notes the sheer scale of this episode: They were attempting to portray the busiest city on the planet, and this meant many times more the usual number of extras than would be typical for a Springfield-set episode. He also mentions the list of background sign gags was three times the normal length, but it’s telling how those signs tend to be used in the episode. There are some terrific gags hidden in the background here: Homer drives past an ad for used prosthetics, while the family’s subway car asks anyone who can throw a football to call up the New York Jets, a joke that has really only gotten more accurate in the ensuing 16 years. But most of these background gags really are in the background, without the usual quick establishing shot that might allow more casual viewers to pick up on the gag. In contrast, places like Port Authority, the Statue of Liberty, and the World Trade Center plaza are rendered more or less accurately. The sign above the bus station simply says “Port Authority Bus Terminal,” with no additional gag layered in. This isn’t the kind of thing most viewers are going to consciously pick up on, but what this approach does is create a sense of a baseline reality that doesn’t necessary exist back in Springfield; that so many landmarks are played basically straight makes New York feel more real than the show’s previous depiction of exotic destinations like, say, Australia. Yet there still are tons of sight gags waiting to be discovered, adding enormously to the sense of scale. A city that large can support multiple interpretations, and “The City Of New York Vs. Homer Simpson” is clever in how it roots Homer and Marge’s divergent reactions in the real history of the city. Admittedly, it’s possible for two people to visit New York at pretty much any time, with one concluding it’s a hellhole and the other deciding it’s a wonder, but it’s significant that Homer’s opinions were formed by a youthful visit to New York in the ‘70s, when the city really was enduring one of its grimmest periods. The DVD commentaries acknowledge that younger audiences aren’t necessarily going to be aware how scary New York used to be, particularly to out-of-towners, and it’s not as though Homer’s flashback strains for verisimilitude: Surely not every ‘70s-era walk from Port Authority to Penn Station featured Woody Allen dumping trash on one’s head, a pimp giving chase, and the C.H.U.D.s attacking. (Do correct me if I’m wrong, New York veterans!) The use of Scott Joplin’s “The Entertainer”—most famous these days for its role in The Sting—lends a timeless quality to the sequence, suggesting that, at least to Homer, New York is always like this. And, you know, it’s just a really brilliant, hilarious sequence, with Reardon and his team working carefully to time the incidents to Joplin’s music. This is one of the all-time great angry Homer episodes, and the first time we see him after Barney disappears with his car sets up the pattern that is going to define the rest of the episode: Homer impotently threatening to punch his friend, then immediately riding off on a kick scooter to (somehow) go pick up his kids. Throughout, there’s at least a kernel of justification to Homer’s unreasoning rage, and that allows the episode to pull off a clever balancing act: Homer is undoubtedly acting like a lunatic here, but he’s always suffering just enough to lend his psychotic quest to escape New York an odd … well, nobility is too strong a word, but it’s in the ballpark. The trick here is that Homer has irrationally picked a fight with a city that is absolutely prepared to brawl right back, up to and including a Central Park carriage driver whipping Homer in the eye. The climactic scene in which Homer gets his hands on a jackhammer and finally gets the clamp off his car is the comedic apex of this: His plan is horrendously misconceived and self-destructive, yet the sheer depth of emotion fueling Homer—something brought out by and complemented by the kinetic energy of the animation—lends the scene a sense of triumph, even if this is by any objective measure a painful defeat. And the final flourish of the scene reminds us that Homer isn’t entirely wrong to mistrust New York: A motorist does take a shot at him, after all. Marge and the kids, on the other hand, get to react to New York as it was in 1997, as a place just barely friendly enough to tourists for visitors to not realize how completely overwhelming the place is. Marge’s studiously mundane worldview is perfect for this role, as she unwaveringly accepts the magic of Manhattan without really understanding what it is she’s looking at. Native New Yorker Ian Maxtone-Graham’s script makes a point of Marge zeroing in on the most boring of all possible landmarks: the bus terminal itself, the Williamsburg Bridge, Fourth Avenue, and of course the immortal Governors Island (which supposedly has actually become a bit of a thing in recent years, but definitely wasn’t in 1997). There’s a temptation here to say that the joke is on Marge, but that really does feel like snobbery: After all, she and the kids have a wonderful day in New York, so does it really matter that she’s looking at the “wrong” things? (A meaner version of this episode probably would have sent the family off to a pointless day on Governors Island, instead of having an awestruck Marge comment on it while standing atop a genuine icon like the State of Liberty.) Marge is the quintessential out-of-towner, yet it’s a fundamentally sweet kind of provincialism: Although most might dream a little bigger, there’s nothing wrong with always dreaming of being in a Broadway audience, especially if one then lives that dream. What the episode leaves us with, then, is the idea that New York is very much what you make of it. All the Simpsons are ignorant of the totality of the city, as perhaps everyone is, no matter what they might insist otherwise, so their experiences are shaped as much by the lens through which they view the city as anything else. New York is colossal enough for a person to look in one direction and see the world’s most iconic skyline—a skyline that will never look quite right again, as this episode sadly, inadvertently underlines— and look in the other direction to see bags of medical waste flying towards one’s face. A classic episode in general, “The City Of New York Vs. Homer Simpson” represents perhaps the best, most meticulous world-building in the show’s long history, and that’s a major reason the episode can now endure as its own kind of memorial to a moment in the city’s history that is now lost forever. In its way, this episode might well be the most authentic single depiction of the city I’ve seen, if only for how the episode juggles all those wild, contradictory realities. That final, ridiculously expensive pullout shot over the end credits says it all: New York City might be a marvel or it might be a hellhole, and in all probability it’s a bit of both, but, whatever else it might be, it’s just something bigger than anything else. Even The Simpsons. Thanks for (hopefully) indulging me as I dipped into rather more personal reflection than I normally would for a review. The context of this episode made it feel appropriate; that’s actually I think the first time I’ve really written about September 11 in even a small way, and it was good to have a chance to look at that day through this rather unlikely lens. 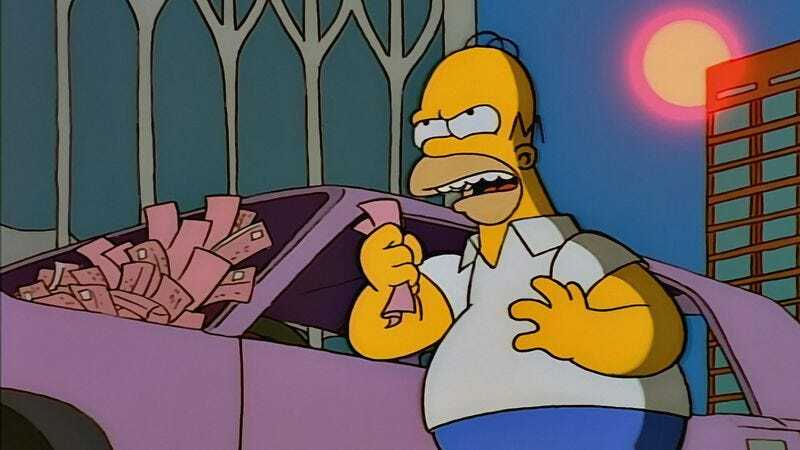 My favorite random little detail: Homer puts on his turn signal as he takes his still clamped car out of the plaza. That’s maybe the funniest almost inaudible sound effect in the show’s history. If you do want to start looking for signs of the decline, I think you could argue that the opening sequence at Moe’s is a little weak; there’s some definite fraying around the edges of the show’s previously impeccable comedy machine. It’s hard to put a finger on exactly, hence why I’m keeping this in the strays, but it just feels like the show is straining a bit to justify Barney disappearing with the car. That said, Moe’s belief that the pope is picked using an egg-based system is more than worth the price of admission, not to mention the pivotal introduction of Duffman.